If society is moving in a direction not of its choosing, it is often because it is being pushed by the self-appointed forces of progress.” Jonah Goldberg, Liberal Fascism. Enter the Progressive Fascists over at the, laughably, IRS-designated non-profit/501 c3, Media Matters and their VP of Lemmings, Angelo Carusone–whose collectivist duty and main objective is to MONITOR, ANALYZE, AND CORRECT the news– but only news that doesn’t fit their progressive narrative. Over the last number of years, Angelo’s job is to silence free speech and debate, particularly conservative speech, and has the Media Matters funding and blessing to do so. David Brock, CEO of Media Matters, flaunted his tax-exempt status, supports Hillary for president and will not be satisfied unless Fox news is eliminated through “guerrilla warfare and sabotage“. Fair and balanced? This tagline has no room in their national conversation and has caused quite the furor in Der Fuhrers at Media Matters and/or NBC. According to an investigative report done by the Daily Caller, David Brock and Phil Griffin, President of MSNBC, were on speed dial. Media Matters executives met many times with Obama’s political advisors, namely Valerie Jarret and Anita Dunn, at the White House or over lunch. Because of their smear tactics, Ford withdrew sponsorship from Lou Dobbs, and resulted in Lou leaving CNN. MSNBC parrots Media Matters talking points. The list of independent and conservative victims who do not fit their established and politically correct narrative are not few and far between, and there will be many more. Angelo has had a target list since at least 2009. Absent of coincidence, NBC/Comcast is one of the largest sponsors of the Macys Thanksgiving Day parade. 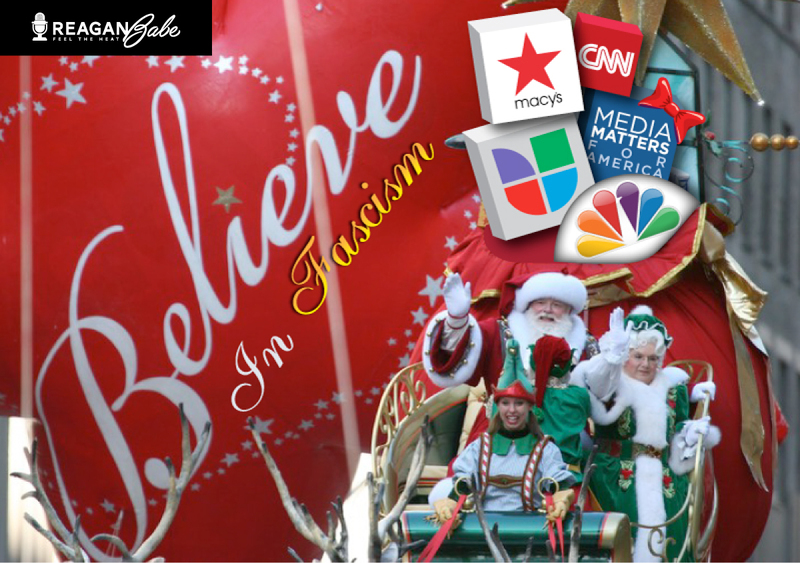 So was it a surprise that Macy’s capitulated to the politically-correct, politically motivated fascists who twisted Trump’s words in order to, once again, craft bogus charges of racism? Below is the transcript of his “racist” remarks. I have taken the liberty of adding hyperlinks illustrating the truths to his statement. So I have a question, if Trump is a racist, is everyone a racist who speaks the truth like this guy? In times of tyranny, speaking the truth is a revolutionary act, and Donald Trump, although, perhaps poorly worded, has been nothing but brutally honest. Many Americans, according to his poll numbers, are listening, and the vitriol from these Progressive Fascists and their sycophants in the press, reveals that their game of fear through intimidation, lying, and bullying is and will backfire–if the American people know the cold, hard, and sometimes ugly, facts. The truth will end up destroyed, much like Hillary’s server, if the fascism marches on– spearheaded by Jose and armed with his lengthy and conservative target list. The truth will be what the colluders deem it to be. Now will the IRS review Media Matters tax exempt status? Under this administration? Not likely.